Sally Hansen is a brand that has a pretty good reputation when it comes to nail care. It can't be denied that Sally knows nails, and that's why the products have a cult following that I am sure grows everyday. Since as long as I can remember, I have always relied on ordinary clear nail colors, for use as my base and top coat. And quite frankly, they just weren't cutting it anymore. It was time to search for the real deal and start looking for a base coat. When I spotted Sally Hansen's Insta-Dri Fast Dry Base Coat at a nearby Lot Less Closeout store for $1.99, I didn't have to think twice. I immediately decided that it was coming home with me. This base coat looked promising, and I was excited to see what it could do for my nails. 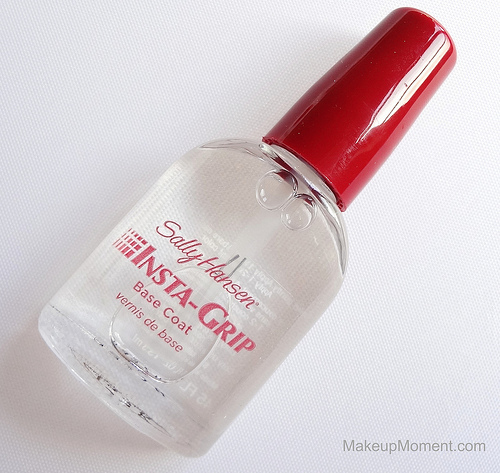 I apply one coat of the Insta-Grip Fast Dry Base Coat on all of my nails and I just love how easy the formula glides on my nail beds. It feels a bit cooling on my nails, too. But that feeling is quickly eliminated once the base coat has dried. Speaking of dry, I am amazed at how insanely fast this stuff dries which is great because that way, I can go ahead and apply my nail color straight away. That's definitely one thing that this base coat has over regular, clear nail polish; the speedy drying time. Another attribute that I noticed with this base coat was how much easier it has become to apply my nail colors. I would occasionally experience some nail bubbling and a lot of bumpy spots because the clear nail polish wouldn't provide a smooth of a surface as what I would have liked for my nails. But now with this base coat, my nail colors glide on with no trouble at all. No more bubbling, or rough textured areas! Since this product creates a smooth surface for my nail colors, I have been obtaining flawless nail color application results, every time. I am lucky that my nails grow pretty quickly. I trim them one day, and they are already growing significantly within 2-3 days time. But I don't have the strongest nails around. They are a bit brittle and they are almost always chipping. 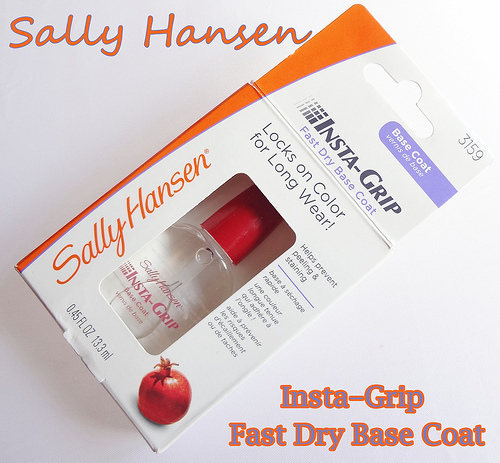 When I saw that this base coat could help with nail strengthening, I was all over it. I have been using this base coat for about 3 weeks now and I don't feel like it is making any difference when it comes to nail strengthening. My nails still feel weak and they still chip every now and then. Also, as for the long wearing nail color bit, I am going to have to disagree. This honestly does not make my nail colors last any longer than they normally would on their own, or with a clear nail color used as a base. If I have a nail color that is known to chip within 3-4 days, that's the same time frame that it peels with this product on. This base coat makes no difference, whatsoever. Overall: Although I don't particularly find this base coat really beneficial to my nail's health, I will continue to use it until I have used it up. Mainly because I love how smooth my nail colors apply over it. I also appreciate that this base coat doesn't contain any DBP, Toluene, and Formaldehyde. I am sure that there are other Sally Hansen nail care products that perform nicely but, I do think it's a shame that this base coat didn't exceed my expectations when it came to nail color lasting power, and strengthening. Well, I have to say that this experience has left me curious as to what other base coats are out there, that are left for me to try. My search for the perfect base coat shall go on! Have any of you tried this base coat? Which are your favorite base coats? I need to step up my nail care & get a proper base coat. You picked this up for a bargain price. I will keep an eye out for this when im next shopping. Great review. Alina, that is my favorite top coat! i LOVE it and actually wrote a review on it too but a while ago. Such a great product really! Hey Maria, I am so glad that this base coat works so well for you :) Thanks for your comment, and I hope you have an awesome day as well, Hun!